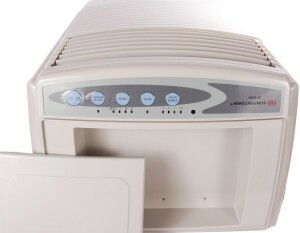 Sunpentown - SF-609 : Portable Air Conditioner Review • The Air Geeks, reviews of air conditioners, dehumidifiers and air purifiers. The SF-609 is an air cooler that features an ionizer. In other words, it is a device that cools air through the evaporation of water. This is therefore not an air conditioner – it also humidifies and consumes les energy. Apart from cooling air, this portable system is also designed to serve as a (natural) humidifier and a fan. In addition, it features an air purifier to ensure that the room has a comfortable environment. This portable system utilizes water to cool air and it is ideal for dry places. The performance of this air cooler is greatly affected by the amount of moisture in the air and it is therefore not suitable for high humidity areas. In case you are looking for an affordable (~$150) system to cool your room, this might be the answer you are looking for. Unlike air conditioners, it is designed to consume less energy and it therefore enables users to save money. How does it compare to its bigger brothers? Our review follows. To begin with, this evaporative air cooler utilizes endothermic reaction to cool the air. By design, it works efficiently in dry climates. Warm air is made to flow through a wick that is usually saturated with water. The warm air loses some of its energy to the water causing some of it to evaporate. The output of this process is cooler air that is blown out to cool the room. This cooling process is different from the one used by air conditioners. As a result, evaporative air coolers consume less energy. It can be a challenge to move a heavy unit from one part of a building to another. This system is designed for easy mobility and users can comfortably move it from one position to another. Apart from having wheels that enhance its mobility, this unit is also light and versatile. It weighs 20 pounds. Unlike air conditioners, this evaporative cooler does not have a compressor. For open spaces and in dry and hot climates (think : Las Vegas-type), it is able to provide cool and fresh air by utilizing the evaporation process. Users can prevent a build-up of moisture in the rooms by leaving the door and windows open. For high humidity areas, an air conditioner is more effective than this unit. For the environment to be pleasant, air must be cool and clean. This system features an ionizer that purifies air to make it fresh and free from odors. In addition, this system has a photocatalystic and nylon filters. The environment can be made even better if a room is well ventilated to allow free flow of air and to avoid excessive moisture in the room. 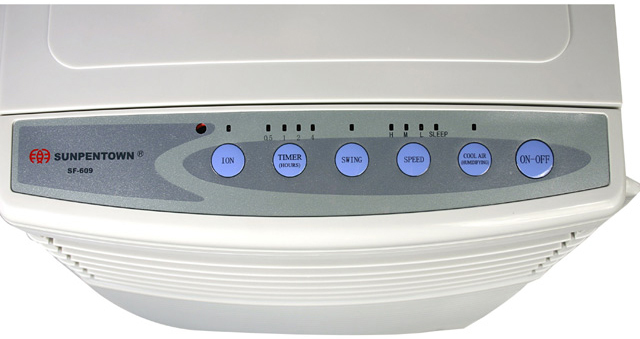 This unit offers three air speeds and this enables users to select an option depending on what they need. The SF-609 comes with a remote control that allows users to adjust settings from any place within the room. For people who like comfort, this is an important feature that spares them the need to walk to where their air cooler is positioned. An evaporative air cooler utilizes water to produces a cool stream of air. A water tank is therefore an important feature of any evaporative air cooler. In the case of the SF-609, it features a large tank with a capacity of 10L. This ensures that the system can run for many hours without the need to refill the tank. Replacing dust filters on regular basis can be stressful if they are not readily available in your area. In addition, it can increase the cost of maintenance especially if the filter is not cheap. To avoid such headaches, this evaporative air cooler comes with a washable filter. Users can clean this filter by rinsing or vacuuming it. Low power consumption. This system consumes less energy and therefore does not increase the electricity bill like most air conditioners. Low price. The price tag for the SPT SF-609 is below $150, which makes it suitable for low budget homes. Unsuitable for high humidity areas. The principle of operation of this air cooler makes it unsuitable for humid areas. Air conditioners are best suited for such environments. Regular refilling needed. For the system to produce cool air, you have to regularly refill it with water and ice. Most users feel that this is too much and they would rather recommend an air conditioner system instead of an air cooler. I hate weeding through the reviews for evaporative coolers because it seems like the majority of bad reviews are from people who have no clue what they are and what they are supposed to do, a few are from people who can't follow basic instructions, and there are only a handful of legitimate negative reviews that are usually due to defective issues. I live in Denver, CO. It's dry here and it's the perfect climate for evaporative coolers. I've had whole-house swamp coolers in previous homes I've lived and know many friends with them. 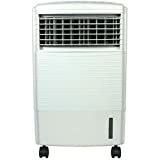 In my home, I have no option for a portable or window A/C air conditioner as I spend most of my time in our finished basement and there's not a good option for exhaust. Last summer we got quotes for central A/C but it's a lot more money than I want to spend and I also don't want the electricity bill that goes along with it. We have a whole house fan (not to be confused with an attic fan) that we run in early morning before it reaches 70 degrees and that we run again at night, usually after 9pm, or whenever it gets cool enough outside. Sometimes with an afternoon rain shower we turn it on sooner. I bought the evaporative cooler to supplement the whole house fan on those reallllly hot days and/or for the middle of the day when we we're not running it due to it being hotter outside than it is inside. The house fan cools the ground floor much better than our basement due to the lack of air flow from our basement windows because of the window well covers we have. Also, this summer I'm pregnant with a due date of August 15th and that doesn't help my comfort situation. Basically, an evaporative cooler is exactly what I wanted and what fit our situation." My wife and I currently live in one of the hottest, driest places in the U.S. -- Las Vegas, NV. Our apartment is mostly shaded and facing away from the direct sun, except for... the HOT room. Our office. "The hot room" faces the south-west side and gets beaten by the direct sun. This little unit is PERFECT for that room. It does a great job of turning the hot room (which is also the room we are in the most) into just another room in the apartment. Now I don't rely on this unit alone to single-handedly take on all 110 degree of Las Vegas heat, but I don't expect it to. It simply does what is intended. It brings the temperature down 10-15 degrees in the room that is generally 10-15 warmer than the rest of the apartment. So, if you live in a region with hot DRY weather (most of California, Nevada, Arizona, New Mexico), these can supplement your AC, put some moisture in the air and take a nice chunk out of your monthly Air Conditioning bill. If you live on the East coast, the southern states, the Midwest or any place HUMID, DON'T BUY THIS. It wont do a thing and will probably just make the muggy, oppressive heat WORSE. You've been warned... I lived in Miami for 5 years and understand that 90 degrees in Florida is WORSE than 110 degrees in Las Vegas. This is because of the HUMIDITY, not the HEAT. You don't see "swamp coolers" in Florida because they just add humidity to the air, and that would just make matters worse. For those who may still be a little puzzled by these and seem to think they're some kind of portable air conditioner... they're not. This is a smaller, updated version of the traditional "swamp cooler" that has been in use on the U.S. west coast & southwest for decades. These work great... IN DRY CLIMATES ONLY!" Truth be told, we are not fans of this unit. Sure, the SF-609 is an evaporative air cooler that is suitable for hot and dry environments, and its energy saving system is ideal for small spaces that are well ventilated. However, unlike air conditioners, this air cooler is not an all-weather system and it performs poorly in high humidity areas. For this unit to deliver impressive results, regular water and ice refills are required, which is not something most users want to do. We would only recommend it to users in very dry regions!